“The best book in the world…because it makes us our best.” — Nichole Bernier, author of The Unfinished Work of Elizabeth D.
$18.95 in hardcover. You can order it at your local independent bookstore, BN.com, and Amazon.com. 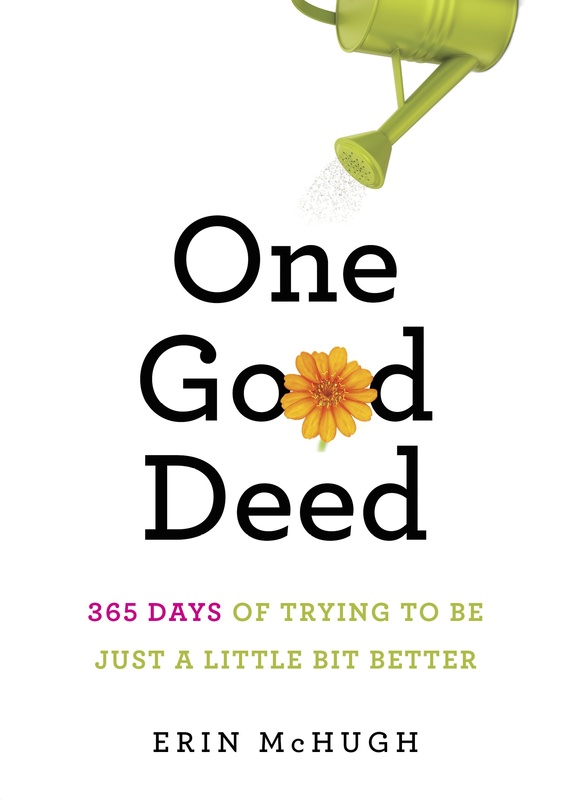 For Christmas my dearest friend purchased each of us a copy of One Good Deed with the understanding that we would read it daily. We started sometime between Christmas and New Year’s Day. (She taped a penny to my book on Dec. 30th, so I’m going to say that was our start date. That part was a bit strange… starting in the middle of a book!) No matter, the entries have been a joy to read, and what has made it even more special has been the quick e-mail (subject line: One Good Deed) that she and I share when an entry touches us. I decided to look you up today to see if you did speaking engagements/book signings. Without sounding too “stalkerish”, have I overlooked a published calendar with such listings? Thanks so much for your lovely note — it seemed sort of odd starting the year of good deeds on my birthday in July, too, but I’m sure you, like I did, got into the groove quickly. Turns out the start date doesn’t matter, does it? There is no calendar, but I do love doing events. I have your email, so I’ll shoot you mine right now. Thanks again, and you and your friend should always feel free to post your deeds here in the “Your Good Deed” section. Could not put it down, just finished, loved it! For me, it is a womderful way to celebrate how we can interact with one another and leave that moment feeling so positive. By either saying or doing something or by keeping quiet, love those moments! I also enjoyed reading about St. Andre Bessette and his devotion to St. Joseph. I was curious about St. Andre’s life and looked him up. His life and yours are patterned similarly, small acts done over time become enormous gifts and blessings for many. Thank you both! Well, Cathy, this is the first and surely the last time I’ll be compared to Brother — I mean, Saint — Andre! Wait until I tell Aunt Tessie! As you read in the book, she remembers him from when she was a little girl. I’ll ask her if she sees any similarities! Thank you for your kind words, and I’m just thrilled you loved the book. Pass the word — and keep passing on the good deeds! Huge, big, HUGE news here tomorrow! Watch the One Good Deed blog for more — that’s October 11! Who can’t is right. Hope it does spur you on. Seems if you can just keep up the regularity of something, it pays off. I’ve found even if you sit by yourself in front of a blank page every day, eventually you write something down. So maybe you delete a lot of it/ Eventually, something sticks. Thank you, Deb! It leaves warehouses today, in fact, so if you pre-order now, it should be in your hands soon!